Paddle your way through the mature floodplain forest and rich backwaters of the Upper Mississippi River National Wildlife and Fish Refuge while admiring the panoramic views of the towering bluffs. Bird watchers, river lovers, and anglers will cherish the diversity that will greet them at every turn. The 4.7 mile Halfmoon Lake Canoe Trail near Kellogg, MN, is a treasure of the Upper Mississippi River National Wildlife and Fish Refuge. The trail is free and open 24/7 during ice out conditions. Camping is available on river islands and beaches on a first-come-first-served basis. Additional information and maps can be found at the Refuge website www.fws.gov/midwest/uppermississippiriver. Location: The Halfmoon Lake Canoe Trail is located in the Winona District of the Upper Mississippi River National Wildlife and Fish Refuge near Kellogg, MN. Halfmoon Landing is located at 12067 622nd Street, Kellogg, MN. From Kellogg, MN take Hwy 61 south, turn left onto County Road 84, turn right onto West Newton Road, turn right into Halfmoon Landing. The 4.7 mile moderate to difficult rated Halfmoon Lake Canoe Trail is the third trail in a series of four designed to take paddlers into the backwater areas of the Upper Mississippi River National Wildlife and Fish Refuge. The trailhead (Halfmoon Landing) is located at approximately River Mile 747.5 and is approximately four miles downstream of the Finger Lakes Canoe Trail and 10 miles upstream of the Straight Slough Canoe Trail. 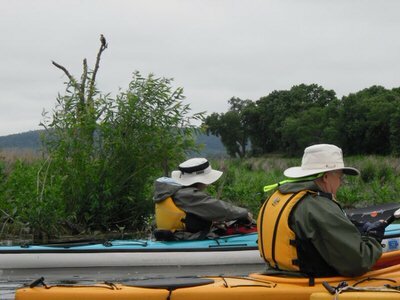 Paddlers who wish to paddle between trails will need to use the main navigation channel and "lock through" (paddlers unfamiliar with the procedure for using a lock should download the booklet “Locking Through” available at the refuge website). Sandy beaches for camping are plentiful along this section of river. There is no fee for camping on the Refuge. The Halfmoon Lake Canoe Trail, like the others, gives paddlers opportunities unavailable in any other part of the country. Spectacular bluffs, mature floodplain forest, opulent backwaters, close-encounters with river otter and the magnificent spectacle of migration can all be experienced on this trail. These aspects and many others were the driving forces behind this section of the Mississippi River's designation as a Ramsar Wetland of International Importance in 2010. Paddlers can spend the night on any of the islands or paddle to one of the beaches on the main navigation channel to enjoy a campfire and evening filled with the sights and sounds of lone tow boats making their way along the river under the cover of darkness. There is one-loop to the Halfmoon Lake Trail. This trail will require the paddler to traverse the main navigation channel for a short time and during high water events (typically Spring/early Summer) the "cuts" or channels between the main navigation channel and the backwater areas may be impassable due to the amount of water flowing through the area. The Weaver Bottoms portion of the trail can be difficult during late summer (August) when extensive vegetation growth can prove challenging to paddle through. Paddling this trail in the fall is recommended for the opportunity to experience the thousands of migrating waterfowl, including tundra swans, which use the Weaver Bottoms Closed Area. All river users are asked to avoid the temptation of entering the Closed Areas after October 15 for a closer view of the birds. Boats of all types will disturb the birds and prevent them from getting the rest and food they need to continue on their long migration. The marked canoe trail does not enter the Closed Area but does go through a popular hunting area. Paddlers should dress brightly so they can be seen and respect the other users of the area. The Halfmoon Lake Canoe Trail is one of four canoe trails located on the Winona District of the Upper Mississippi River National Wildlife and Fish Refuge. Spend a few days exploring the river and its unique communities! Paddlers heading downstream from the Halfmoon Lake Trail can pull into the landing at Minneiska, MN (River Mile 742) to enjoy the local restaurants and spectacular views. Off-river camping is available at Bass Camp (River Mile 738). All canoe trails are free and open 24/7 during ice-out conditions. Fall is spectacular for colors but paddlers should dress brightly as all the trails travel through areas open to hunting. Services are limited in the immediate area of the trailhead with the nearest restaurants and gas station at Kellogg, MN. This trail was developed and signed as an Eagle Scout project in 2007.